Teotihuacán was once one of the great cities of the New World. Photo TAC/ Mark Michel. Between 200 B.C. and A.D. 1519, the Aztecs, Toltecs, and Teotihuacános pushed the development of North American civilization to its zenith, before being destroyed by the Spanish invasion. On this tour, we’ll see the ancient cities and climb pyramids that rival those of Egypt. An expert on the region’s archaeology will accompany us throughout the trip. To join us, contact us at tours.tac@gmail.com or by phone at (505) 266-1540. Join us in Mexico City, where we’ll stay four nights in the friendly Zona Rosa district with its sidewalk cafés, shops, and charming restaurants. At the Aztec capital of Tenochtitlán, now the center of Mexico City, we’ll tour the ruins of the Great Temple that were rediscovered in 1978. 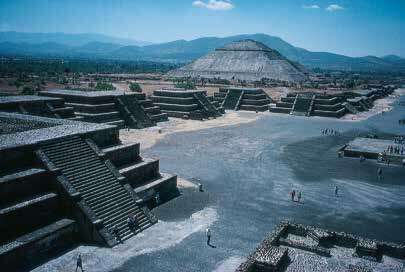 We will visit Aztec sites in Mexico City including the sister city of Tlatelolco. We’ll also visit Guadalupe, where Catholic and Aztec religion merge, and the National Palace with its fabulous murals of Aztec life. We’ll visit Tula, the great Toltec capital founded in the 10th century by Topiltzin. From Tula, the Toltec warrior class ruled a vast territory until their decline and disappearance in the 13th century. We will also visit the Aztec sites of Tenayuca and Santa Cecelia. We’ll spend most of the day touring the Anthropology Museum and its treasures of the Teotihuacán, Toltec, and Aztec cultures, including the huge Aztec calendar stone. Later, we’ll have time to explore the Zona Rosa. We’ll travel south of Mexico City to explore the spectacular newly excavated ruins of Xochicalco, situated on a terraced hill. At the Pyramid of the Feathered Serpent, we’ll see elaborate Teotihuacán-style relief carvings that reflect Maya characteristics as well. We’ll spend the evening at a hacienda built by Cortés in 1529. We’ll visit the ruins and splendid Olmec stone carvings at Chalcatzingo. One sculpture known as El Rey is still honored by local people. We’ll travel to Cholula where we’ll spend two evenings at the Villa Arqueologica. Cholula once dominated the entire Puebla-Tlaxcala region, flourishing around the same time as Teotihuacán. It is best known for the Great Pyramid of Tepanapa. We’ll visit the beautiful and well-preserved Maya-influenced Cacaxtla murals found in a great palace near Tlaxcala. We’ll visit Puebla, Mexico’s best-preserved colonial city. The beauty of its houses and streets makes Puebla a feast of light and color. While in Puebla, we’ll visit the new archaeology museum and a famous tile and pottery maker. Later, we’ll travel to the Villa Arqueologica at Teotihuacán. We’ll visit Teotihuacán, a city that flourished between 200 B.C. and A.D. 750. According to Aztec mythology, the gods came together at Teotihuacán to create the Sun and Moon. Containing 600 pyramids and a population of 200,000, it was an important center of commerce, art, and religion. We’ll spend the evening in Mexico City at the airport hotel. Tour participants depart for home. Cost includes first-class hotel accommodations based on double occupancy (single supplement $380), lunches (except arrival day, when there will be a welcome dinner), happy hours, admittance fees, tips, tours, background reading, airport transportation and surface travel via air-conditioned bus with restroom. Not included are meals other than lunches and travel to and from Mexico City. NOTE: A modest amount of walking is required. Some sites have rubble, undeveloped trails, and steep stone stairs. Climbing these stairs is necessary in order to see some of the ruins. The tour is at an altitude of 7,000 feet. People with heart or respiratory problems should consult a physician. People unaccustomed to higher altitudes sometimes experience fatigue and dizziness. For further information, or to join us, contact us at tours.tac@gmail.com or by phone at (505) 266-1540.